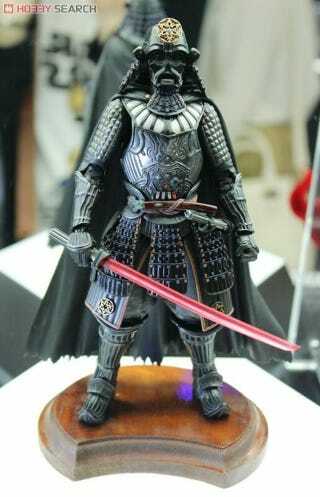 The Dark Samurai of the Sith! Figures that turn into eggs for some reason! Collectible severed heads! These are just a few of the awesome and/or insane Star Wars toys revealed by Bandai at the Tokyo Toy Show this week that you need to check out. Somewhat less excitingly, Bandai will also be releasing more movie accurate 6-inch Star Wars figures of Vader and the Stormtroopers as part of their Figuarts line (below), which means they'll probably be nicer, better articulated and more expensive than Hasbro's equivalents. Look at the little photon torpedo going down the exhaust port! I can't imagine what this will cost, but man, keep a look out for it, if only so you can let me know when I can pre-order it. The "Head Collection," or basically the Star Wars collectible severed head line! You know, I'd like to pretend that these aren't kind of cool, but I know at some point Bandai is going to release a figure of Vader's helmet with the faceplate cracked open and Luke's head inside, and I'm going to lose my mind and pay $50 on eBay, so perhaps it's best if I don't judge.